Hiking, excursions on horse or mule, mountain-bike, canoing,rafting, fishing, caving, visits to craft factories, etc. The province of Chaouen offers magnificent landscapes for hiking . Also, strolls on mules, excursions on horse-back or cycling can be done. Along with fishing the impressive streams or rivers are ideal for canoing in some zones and also rafting downhill in a canoe.The sector is also very good for people who enjoy caving since the importance of the karstic phenomenon has filled the bulk of the caves. We recommend the services of a guide for all these activities. Also, cultural tours can be arranged to visit the traditional towns where it is still possible to see agricultural or artisan rural activities. 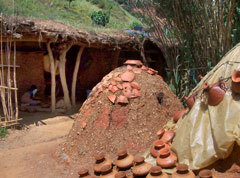 An example of these types of activities can be seen in Fran Ali, one of the main locations for pottery production in the Rif with its traditional furnaces with firewood.